CHEAP, FAT and OPEN is an open source platform for musical exploration, composition and performance. The platform is CHEAP, and OPEN – welcoming you to experiment. A combination of the old and new: the raw 8bit / chip tune approach combined with wireless connectivity, state of the art open source hardware, and expandability – gives us that FAT sound. It is portable, allowing you to make music on the go. The platform is a performance instrument, giving a full 1½ octave keyboard control in compact packaging, through a classic stylophone interface. It is also a sequencer, allowing you to program rhythms and melodies, and play them back in sync with other platforms and instruments. This is NOT a finished product. It works as is, but inside the platform rests an atmega328 processor, which can be programmed in the Arduino environment. This means that the platform can be modified, expanded, and tweaked to meet your exact needs. CHEAP, FAT and OPEN is designed for geeky musicians, the chip tune community, the makers, the circuit benders, the interaction designers and the musical programmers, and anyone else who wishes to experiment with sequenced / networked / low-level musical exploration. This project is based on knowledge and inspiration from many different communities. I hope that by bridging these different creative communities, we can create something beautiful together. this project is open source. every thing is released under a creative commons, non-commercial, attribution, share a like license. 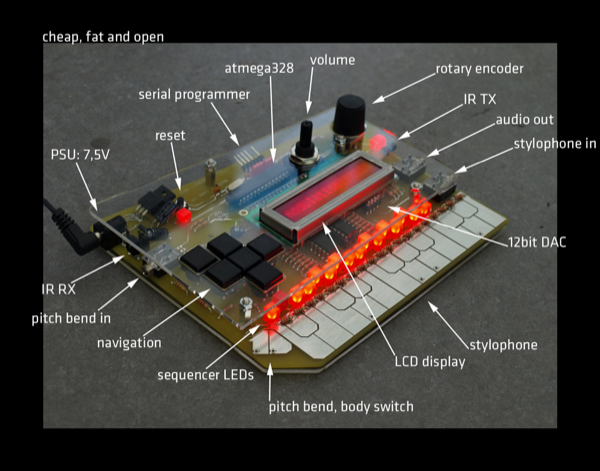 this project is based heavily on the arduino platform and community, and the DAC sound circuit is designed by critter and guittari for the arduino pocket piano project. massive respect to the community, and thanks for making your projects open!